There's a perception that religion and science go together about as well as mayonnaise and marshmallows. In some instances, this is, perhaps, true. But on a typically warm Southern California January in 1933 at the California Institute of Technology in Pasadena, California (the same place and same time that Jack Parsons of rocket science fame was doing his experiments – history intersecting! ), religion and science proved that these two ideals didn't have to be enemies. On that day, some of the greatest science luminaries of the time from around the world, Edwin Hubble and Albert Einstein to name two, gathered to hear a series of lectures. But it was one man and one lecture that caused Albert Einstein to declare, "This is the most beautiful and satisfactory explanation of creation to which I ever listened." It is well known that on the eve of the Third Reich's rise, Einstein left his homeland of Germany for the United States. But few know that traveling with him was Belgian Catholic priest Georges Lemaitre, a man that Einstein greatly respected. Georges Lemaitre was a religious man, but also a great scientist himself, a cosmologist in fact. He studied the universe and, most notably, its beginnings. His research, beliefs, and conclusions greatly influence the way we understand our very existence today. Born in 1894 in Charleroi, Belgium, Georges took an early interest in figuring out how things around him worked. He began his studies in civil engineering at the Catholic University of Leuven, the largest French-speaking university in Belgium. He took a break from his studies to serve in the Belgian army as an officer during World War I. He performed admirably and, at the end of the war, he received a Belgian War Cross, an award for bravery on the battlefield. He, then, returned to the university and earned degrees in mathematics and philosophy. Ever since Georges' was a young boy, he embraced religion and understood the relation it could have with science. He emulated his former teacher, Cardinal Desire Mercier, who held progressive beliefs on philosophy and cosmology. So, instead of entering a life of academia, he entered the priesthood. On September 23, 1923, Lemaître was ordained as a priest by his spiritual teacher, Cardinal Mercier. During his spare time, (now) Father Lemaître continued his scientific studies, especially on the theories of general and special relativity. Cardinal Mercier, recognizing Lemaître's talents, allowed him to go study at the prestigious Harvard Observatory. During the same time, Lemaître earned a Ph.D in physics from MIT. Lemaitre's considerable and varied studies allowed him to cross paths with other noted astronomers and cosmologists of the day, including George Hale (discoverer of solar vortices and magnetic sunspots) and Vesto Slipher (galactic redshifts and oversaw the discovery of Pluto), which had a great influence on his later findings. It was at this time that Lemaitre came up with a profound theory that still impacts our study of the universe today. In 1927, he published his article "A Homogeneous Universe of Constant Mass and Increasing Radius accounting for the Radial Velocity of Extra Galactic Nebulae." In it, he proposed and described his theory of an expanding universe. Using Einstein's theory of relativity as a guide, Lemaitre speculated that space is constantly expanding and, therefore, the distance between galaxies is also increasing. Later, Hubble would demonstrate the same thing and even to this day is generally given credit for coming up with the idea. Further, Lemaître discovered what has since become known as "Hubble's law," a rate of expansion related to the galaxies' distance from Earth. Lemaître also derived what is now known as "Hubble's Constant." In both of these instances, he did this before Hubble published his work concerning these same revolutionary ideas. Hubble's real contribution in this case was to provide the observational basis for Lemaitre's mostly mathematically-based theory. Unfortunately for Lemaître, his Nobel Prize-worthy paper (though at the time astronomers couldn't win Nobel Prizes for their work in astronomy as it wasn't yet considered part of Physics) had little impact on the scientific community due to it being published in a journal hardly read outside of Belgium. But one man in particular read it, Albert Einstein. Lemaître and Einstein met for the first time in 1927 at the famed fifth Solvay Conference in Brussels. Impressed with Lemaître's findings, but not swayed, he told him, "Your calculations are correct, but your physics are abominable." Essentially, Einstein thought Lemaître's math was correct but what the math seemed to show was not. Eddington translated Lemaître's work and had it published in the "Monthly Notices of the Royal Astronomical Society," a peer-review journal still in existence today. After this publishing, it became apparent to both skeptics and Lemaître himself that there was something missing from this theory. The universe is continuously expanding, but when and how did the expansion begin? If the world has begun with a single quantum, the notions of space and time would altogether fail to have any meaning at the beginning; they would only begin to have a sensible meaning when the original quantum had been divided into a sufficient number of quanta. If this suggestion is correct, the beginning of the world happened a little before the beginning of space and time. This would be coined later in a collection of essays in 1950 by Lemaître as "The Primeval Atom," where he would also refer to the the beginning as a "now without yesterday," or mistranslated and more popularly known as "the day without yesterday." This was the foundation of what would become known as the"Big Bang Theory," after several other scientists would add to Lemaître's theory. Many skeptics of the time did not agree with this origin theory. They believed that Lemaître's religious background clouded his scientific process. Essentially, what Lemaître was claiming, according to critics, was that something somehow had to have created the "primeval atom," leaving open the possibility of a greater being. 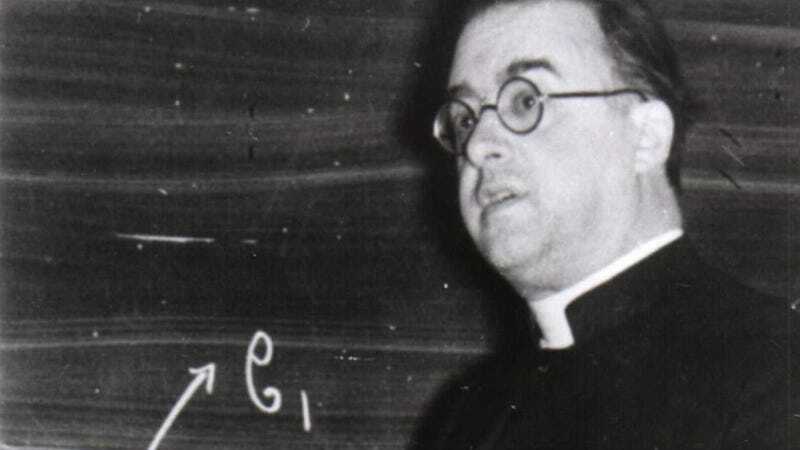 In fact, Pope Pious XII proclaimed in 1952 that the big-bang theory affirmed the notion of a "transcendental creator" and, therefore, was in harmony with Catholic dogma. 'There is no conflict between religion and science,' Lemaitre has been telling audiences over and over again in this country …. His view is interesting and important not because he is a Catholic priest, not because he is one of the leading mathematical physicists of our time, but because he is both. Besides noting that the universe was expanding, Lemaitre also theorized that the universe was expanding at an ever accelerating rate. It would be another six decades or so before this would be proven observationally thanks to the Hubble telescope and a supernova. In later life, Lemaître devoted a considerable amount of his time to computers and the emerging field of Computer Science, including significant work with Fast Fourier transforms and computer languages. When Eddington translated Lemaître's paper into English from French in 1931, there were actually two pages missing from the original. The pages were missing were the ones that dealt with the Hubble constant, hence the reason why many people associate this finding with Edwin Hubble himself. The reason this segment was not in the English translation is unknown. The Fifth Solvay Conference in Brussels was designed for the world's most notable physicists to come discuss the newly conceptualized "quantum theory." In attendance at this conference were 29 people, 17 of whom either had won or would go on to win a Nobel Prize. Also there was Marie Curie, world-renowned chemist and physicist who pioneered research on radioactivity. She was not only the first woman to win a Nobel Prize, but first person ever to win the prize in multiple fields of scientific study. She also had two duels fought over her, which you can read more about here. Very shortly before Lemaître, another scientist also hit on similar ideas as Lemaître concerning the expansion of the universe, Alexander Friedmann, whose work was little known despite being published in the well-known Zeitschrift für Physik and that he had shared his ideas with Einstein, which Einstein at the time dismissed- a fact which later became one of Einstein's biggest regrets of his scientific career. Matt Blitz writes for the wildly popular interesting fact website TodayIFoundOut.com. To subscribe to Today I Found Out's "Daily Knowledge" newsletter, click here or like them on Facebook here.